PUTTING THE "KIND" IN CHRISTKINDLMARKT! 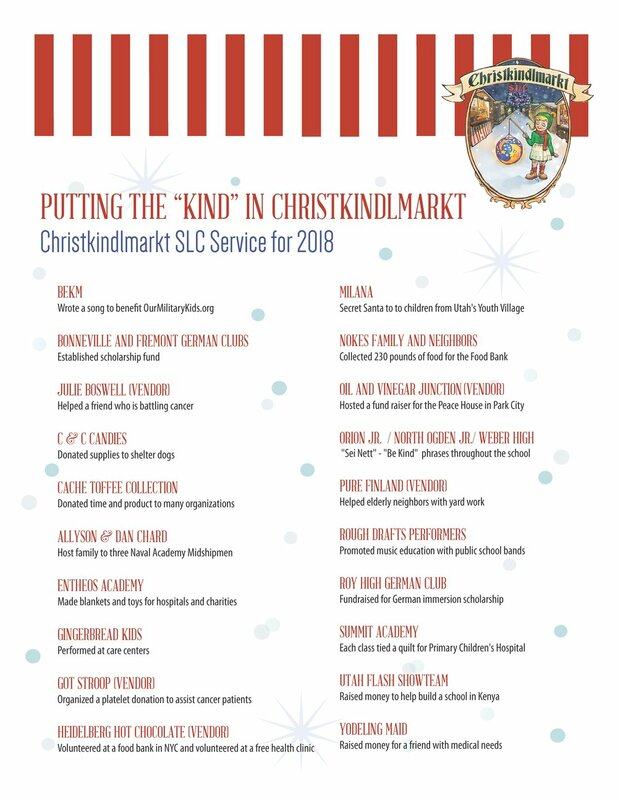 Our mission at Christkindlmarkt-SLC is to encourage children to serve others, and then celebrate that service at the market. This commitment stems from the German story of St. Martin and his charitable acts. All of our performing groups take part in a service experience before they participate in the market. We also encourage families, friends, and neighborhoods to develop a service experience and then come celebrate this service at one of our children's parades. You are invited to march in the St. Martin Lantern Parade on Thursday, November 29 at 6 p.m. celebrating your service. Please let us know you are coming so we can give you instructions on how to participate at ckmslc@gmail.com. If you prefer watching a parade and not marching, join us for the Friday or Saturday parades. We would like to recognize your children for the acts of service that they plan and participate in. Please send us a short email to christkindlmarktslc@gmail.com and share with us what your group chose to do and how the experience impacted you. Pictures are always a welcome treat! You can also share your service experience with us on our Facebook page. The following are contacts for community outreach that might give you some other ideas. Serves people who are homeless, have mental health issues and addictions. Donations needed: clothing (especially warm and winter clothing), gift cards, flashlights, new underwear and socks, diapers, drawstring backpacks, etc. Serves and shelters primarily abused, neglected and abandoned children and youth in Salt Lake, Ogden, Utah Valley and Moab. Donations needed: gift cards, new clothing of all sizes, new coats, shoes, socks and underwear, diapers, new toys, books and puzzles, hygiene items, etc. Christmas Box House also shares Christmas gifts with many other agencies serving children and families, especially at Christmas time. Serves hungry people throughout the state providing food to Food Pantry's across Utah. Donations needed: canned items such as stew and chili, tuna, canned vegetables and fruit, peanut butter, soup, etc. Cash is always appreciated and can be used to purchase much more needed food. Serves homeless individuals and families. Donations needed: cash, new pillows, towels, coats and ackets, jeans and warm clothing, hats, gloves, boots and shoes, new underwear, blankets, diapers, baby bottles and formula. Serves mainly refugees in the state. Donations needed: family mentors, ESL tutors, set-up new homes, trainers, financial education volunteers, etc. Serves the homeless and refugees. Donations needed: cash, furniture, clothing (gently used), hygiene kits (including shampoo, toothbrush, toothpaste, comb, soap, deodorant, etc. ), cleaning supplies, kitchen items, new underwear and socks. Serves boys and girls facing adversity with strong, enduring one-to-one relationships. Donations needed: volunteer mentors, used clothing and household items that are reused or resold. Serves children in foster care throughout Utah. Donations needed: cash, holiday gifts or all kinds, backpacks, hygiene kits, etc. Serves families of children who are hospitalized so they can have a temporary home away from home. Donations needed: cash, paper prodcts (plates, cups, utensils), paper towels, laundry soap, dryer sheets, sanitizing wipes, kids cereal, frozen dinners and other food for special events. There are schools throughout the state who have students in need of school supplies such as paper, pencils, colored pencils, crayons, composition books, erasers, glue sticks, etc. These schools can be located by contacting your local school district. There are churches throughout the state helping those in need, Please contact a church in your area if you desire to assist.